North Korea sent a squad of 230 female cheerleaders to Pyeongchang, where they made quite a spectacle cheering on a joint North-South hockey team. Unified Korea women’s hockey team lost their Olympic debut match to Switzerland on Saturday in Pyeongchang, but that didn’t dampen the enthusiasm of North Korea’s cheerleaders. “Go for it, go for it, our players, go for it,” chanted the cheerleaders, sporting coordinated red outfits and waving the unified Korea flag as Switzerland dominated the joint Korean hockey team 8-0. The chanting increased even more during the last minutes of the game. A banner held by the cheerleaders read, "We're One," and depicted the unified Korean peninsula in a soft pastel blue from the flag. 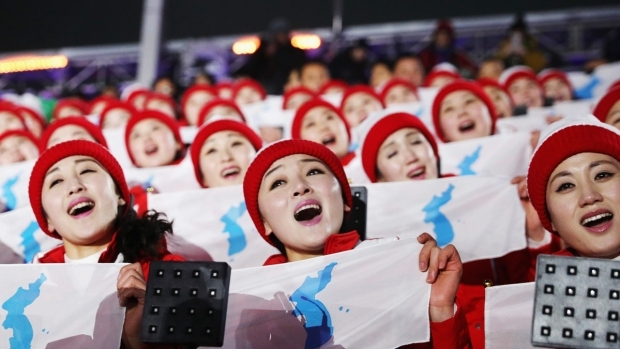 North Korea sent 22 athletes to this year's Winter Olympics but deployed a 230-strong all-female cheerleading squad. Dubbed in South Korea as the “army of beauties,” the cheerleaders were attending the Olympics in a sign of warming ties between the two Koreas that some U.S. officials have warned against. The sold out hockey game saw home fans chanting in support with the North Korean cheerleaders leading the cheers rinkside. During a timeout, the cheerleaders tried to start fans doing the wave, only to see that trickle out as play resumed. The cheerleaders appeared at several Olympic events in Pyeongchang, performing their own chants in the stands, even when other music, including Bruno Mars' "Uptown Funk," was playing in the background. Meanwhile, Kim Yo Jong, the powerful sister of North Korean leader Kim Jong Un was watching the team's historic first hockey match with South Korean President Moon Jae-in at the Kwandong Hockey Center. Kim Se Kyoung, 40, a teacher from Seoul, South Korea, was in the arena to watch the match. She told NBC News her grandmother is from North Korea. “She’s 95 years old. She longed for unification with North Korea,” Kim said with her two children nearby in the stands. “Her granddaughter and grandson are here and this game is very meaningful for her,” she said. “It’s very hard to express her feelings. It could be one step for peace in Korea,” Kim added. Do Yeon Lee, 14, of Seoul told NBC News he traveled to the Olympics just to watch the Korean women’s hockey game. “I am South Korean and although our country is divided, I think we are the same people," Do said. “It’s like an honor to be here." Earlier, hundreds of spectators lined the streets outside, chanting and waving small "unification flags" amid gusting, chilly winds. One man held up a sign that read, "The peace of all mankind."